This is one project that we've been excited about for a long time, and are happy to share with you now that it's finally complete. This client in Long Island, NY sent us an inspirational photo for a zinc range hood she found online and we worked with her and her designers to modify the design to meet the needs of her new home. Over the summer, we began getting a lot of requests from potential clients who were interested in this style of zinc range hood. It's an incredibly popular style on Pinterest, and at one point, we were getting this photo at least once a day in our inbox for pricing. We worked with the client and her designer to make sure that the design was right and was exactly what she wanted for her home. Most of our custom range hoods take about 8-10 weeks in production time. Since this zinc range hood went through a few design tweaks and changes, it took a little longer than usual, but we could not be more pleased with the end result. The above photo gives you a good idea of the size of this range hood. 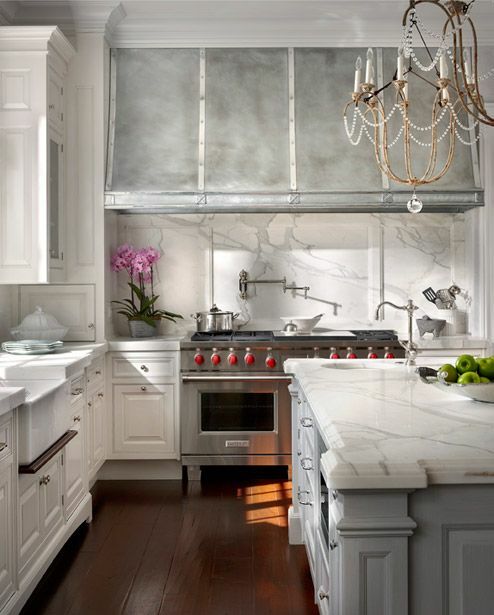 This range hood will definitely function as a focal point for the client's crisp white kitchen. This photo from the installation illustrates how the cool zinc tone compliments the white tile backsplash and white cabinetry throughout the kitchen. The aesthetic in this room is very fitting for a home on the Hamptons, reflecting the coastal, beach look, while still fitting into the upscale nature of the community. For more examples of Brooks Custom's completed range hood, visit our online photo gallery. As this project shows, feel free to send us any inspirational photos you find and we will work with you to create your custom range hood! Contact us at 800-244-5432 to talk about your designs, and send any pricing inquiries to quotes@brookscustom.com.